This is a fantastic one pot meal. It's not difficult to throw together and can feed a fairly large group. It's packed with flavor, and has a nice soft spicy flavor. A few things to remember. You need a thicker filleted fish and a fish that has some fat. Cod is perfect, as are hake and monkfish. Halibut could work, but tuna would be a bit too dry. 1 1/2 lbs Cod, cut into fairly large pieces. Dusted with Old Bay Seasoning or a Cajun spice mix (Tony Chacheres is perfect) on both sides. Preheat your oven to 375F/190C/Mark 5. Heat 3 Tbsp of oil a heavy Dutch oven (Le Cruset is perfect), that has a cover and can be put into the oven. Add the onion, garlic, red pepper and celery and salt and pepper and sauté until lightly browned. While sautéing the vegetables, heat up a sauté pan with the remaining 1 Tbsp of oil and lightly sear your cod. Just 1 minutes per side and then set aside. 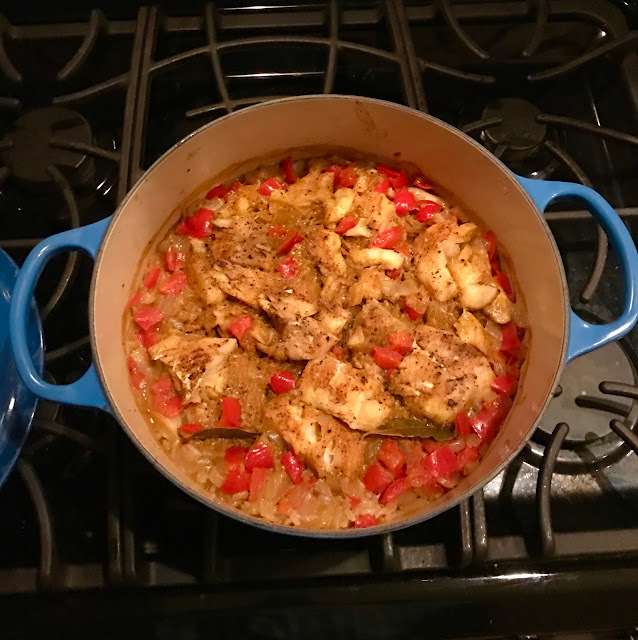 Add the rest of your ingredients to the Dutch oven, except the fish, rice and vegetable broth and sauté for 3-4 minutes. Add the rice and sauté for 1 minutes, coating well. Add the broth and bring up to a simmer. Gently place the fish into the broth and put on the cover and into the oven for 35 minutes. Remove from oven and allow to rest covered for 5-10 minutes and serve with hot sauce. Vegan? Vegetarian? What's the deal?